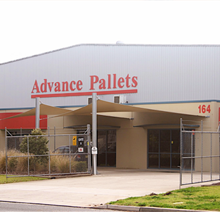 Advance Pallets is a 100% Australian owned family business; which continues to supply major commercial and industrial companies world wide for over 20 years. Our client base and productivity continuously advances, as we manufacture and ship thousands of products, to destinations world wide. As the largest pallet manufacturer in NSW, we also have the largest raw material storage capacity, the latest manufacturing equipment, with a number of automated production lines capable of running simultaneously. We guarantee that your product will be manufactured and delivered promptly - all at competitive prices.